During the Middle Palaeolithic, between 127,000 and 40,000 years ago, humans that lived along the banks of the river Manzanares (now Madrid, Spain) ate pachyderm meat and bone marrow, according to a study that found percussion and cut marks on elephant remains in the site of Preresa. So if you want to try a fad paleolithic diet, get a cheap spear and see how you do bringing one of those babies down first. In prehistoric times, hunting animals was dangerous and required a considerable amount of energy. As you can imagine, when the people of the Middle Palaeolithic bagged an elephant, they didn't leave much behind. The humans that populated the Madrid region 84,000 years ago fed themselves on these prosbocideans' meat and also the bone marrow, according to the new work. There hadn't been much direct evidence of residents consuming elephant meat before and it is still to be determined whether they are from the Mammuthus species of the Palaleoloxodon subspecies. The researchers found bones with cut marks, made for consuming the meat, and percussion for obtaining the bone marrow. "There are many sites, but few with fossil remains with marks that demonstrate humans' purpose" Jose Yravedra, researcher at the Complutense University of Madrid (UCM) and lead author of the study told Servicio de Información y Noticias Científicas (SINC). Researchers have found cut and percussion marks in elephant bones in the site of Preresa. This is the first time that percussion marks that showed an intentional bone fracture to get to the edible part inside have been documented. These had always been associated with tool manufacturing but in the remains found, this hypothesis was discarded. The tools found in the same area were made of flint and quartzite. The team, made up of archaeologists, zooarchaeologists and geologists from UCM, the Institute of Human Evolution in Africa (IDEA) in Madrid and the Spanish National Research Centre for Human Evolution (CENIEH) in Burgos, collected 82 bones from one elephant, linked to 754 stone tools, in an area of 255 metres squared, in the site of Preresa, on the banks of the river Manzanares. 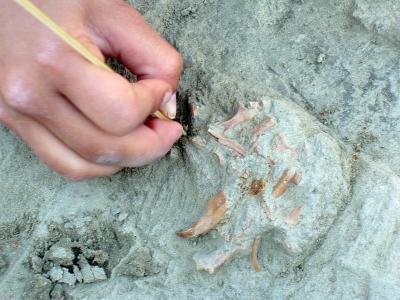 In the case of the cut marks on the fossil remains, these add to the "oldest evidence of exploiting elephants" in the site of Áridos, close to the river Jarama, according to another study published by Yravedra in the same journal. "There are few records about the exploitation of elephants in Siberia, North America and central Europe", the zooarchaeologist explains. The internal organs were what the predator ate first, be they human or any kind of carnivore. The prehistoric signs of the banquet help researchers to find out who was the first to sit down at the table, as the risk of hunting an elephant posed the question as to whether humans hunted it or were scavengers. "This is the next mystery to be solved" Yravedra replies, who reminds us that there is evidence of hunting in other smaller animals in the same site. However, due to the thickness of fibrous membranes and other elephant meat tissues, humans did not always leave marks on the bones. "And for this reason, sometimes it is difficult to determine if humans used their meat". Animal fat was highly valued by hunters and gatherers that had a diet rich in meat and low in carbohydrates. When there was little meat, other resources such as bone marrow became a source of lipids. According to the study, this practice was not very common due to the difficulty of extracting the marrow from the bones. Furthermore "exploiting the fat is something that has not been reported until now" the researcher says. Other food sources, such as brains, had the same nutritional benefits. Published in the Journal of Archaeological Science.